A common view about the millennial generation – generally defined as individuals born between 1980 and 2000 – is that they can be difficult to engage and retain as employees. The stereotype suggests that they rapidly hop from one job to another, and companies that hire them grumble about bad attitudes and high employee churn. As with most stereotypes, some data supports this narrative. Analysis from Gallup reveals that 21% of millennials reported changing jobs in the last year, a rate three times higher than the number of non-millennials, costing the U.S. economy $30.5 billion annually. However, a growing body of research minimizes the actual differences in attitudes, values and actual job-hopping behavior compared to previous generations. This was certainly the experience of John Sanchez, whose organization found success by resisting the temptation to pile on the millennial-bashing bandwagon and instead focused on delivering meaningful leadership. Sanchez is the former executive vice president of global operations at Sysomos, a fast-growing, high-tech startup with offices in Toronto, New York, San Francisco and London. In this opinion piece, he explains how he and his colleagues implemented a strategy to engage and retain 100% of their largely millennial operations team for three years. At the end of my first day at our Toronto headquarters, I was invited to “an airing of grievances.” The newly appointed CEO of Sysomos, a high-growth cloud service startup, had called a meeting with customer-facing teams to hear concerns about the direction of the business, and he asked me to tag along. At the front of a room full of 20-somethings, an energized young woman with a French-Canadian accent paced around the easel, jotting down the group’s objections with an air of urgency. I found myself wondering: What have I gotten myself into? In my mind, I played back my discussion with the CEO defining my role and responsibilities, held shortly before my official start date. Sysomos delivered important insights from conversations on social media to some of the world’s largest and most important brands, and had a great vision for the future. I was to focus on professionalizing operations and preparing the business for the challenges of scale. To be fair, during our hiring discussions the CEO briefly addressed some of the turnover and engagement issues. While the trend of 25%-30% annual churn did not fall outside of norms for the tech industry or for millennial workers, neither he nor I expected the level of discord that was playing out before us. As our scribe dutifully added comments to the long list of concerns, the true weight of the challenge began to dawn on me. It was clear that the teams felt frustrated, disengaged and marginalized and were now at a breaking point. I hadn’t worked in the tech space or exclusively with millennial teams, but I had spent decades leading teams, about half of that time as an executive in a traditional service environment. My experience bore out the exhaustive research and case studies that establish the positive relationship between strong, engaged teams and thriving service organizations. Attending to our team could not be an afterthought; it had to be the foundation of our strategy, grounded in effective leadership. Rather than downplaying the apparent low engagement among client-facing teams and writing off problems to any of the popular theories that blame millennials, I spent time speaking with our staff to corroborate their concerns. It was obvious that our leadership practices were not serving the team. “Leading well” goes beyond checking the box of the specific actions that address the core responsibilities of leadership. 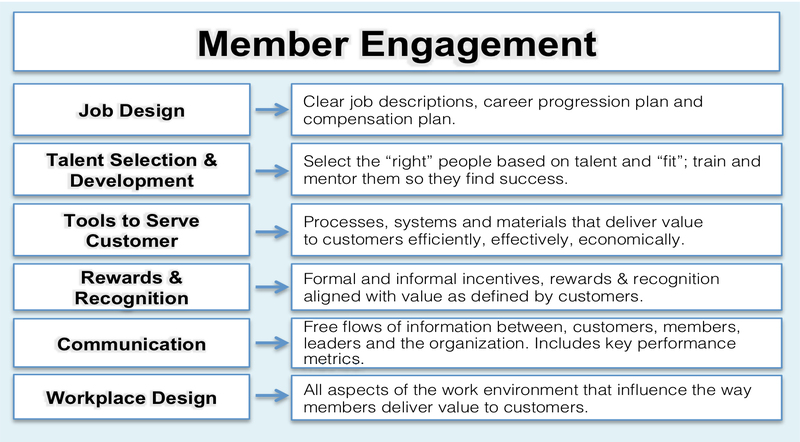 These include setting objectives, organizing resources, training and motivating followers, balancing needs, and ensuring that the organization and members benefit from the relationship. The most critical and difficult dimension of leadership responsibility is the balancing of needs, also called the dilemma of leadership. Employees join organizations expecting to learn and develop skills, become part of a team, and to satisfy economic and other needs. When organizations consistently fail to address those needs, people typically disengage and ultimately defect. That pattern was emerging at Sysomos. Simply attending to team members’ needs, however, is not enough. A leader’s actions only take root in a healthy atmosphere. A leadership climate is the pattern of shared assumptions that inform the way members perceive, think and feel about problems. Leaders must act as positive role models and use their power to influence in the service of the organization to reinforce values of fairness, respect and dignity. Unfortunately, today’s millennials often join organizations only to find themselves diminished, maligned and marginalized by the very leaders and tenured colleagues who should be mentoring them. When I joined Sysomos, the leadership climate was out of balance, and because of that, the effectiveness of our engagement efforts were diminished. With input from the team and key leaders, and the support of our CEO, we executed a turn-around plan. Our approach had two points of focus: Developing solid leadership actions that concentrated on the core responsibilities and creating a healthy leadership climate. With an eye towards effectively leading every team member, regardless of generation, and maximizing their engagement, I focused on thorough implementation of an established leadership model and recognized best-practice approach called “service profit chain.” The idea of the “service profit chain” was popularized in the 1990s by James Heskett, Thomas Jones, W. Earl Sasser, Leonard Schlesinger, and Gary Loveman, professors of service management at Harvard. The service-profit-chain model describes the positive relationships between “employee loyalty,” “service value,” “customer loyalty” and profitability. I personally experienced the power of this strategy from my work at Caesars Entertainment, where Loveman deployed it as a capital-efficient source of competitive advantage that helped propel Caesars Entertainment to the top of its industry. For the purposes of this discussion, I will focus on the elements of the Service Profit Chain relevant to developing team-member loyalty: job design, selection and development, adequate tools to serve customers, rewards and recognition, communication, and workplace design. Job Design: Commitment only begins when team members understand what they give and what they get, so clarifying expectations was a top priority. We reviewed every role to ensure that job descriptions, objectives and performance measurement criteria were clear. An important and often overlooked element of job descriptions is a definition of the member’s responsibility, latitude and authority with regard to serving customers. This was critical to reducing intergroup conflict based on unclear boundaries between different functions (pre-sales, sales, sales ops, legal and customer success). Partnering with our human resources team, we reviewed our compensation plan designs to ensure they were clearly defined and market competitive. I set the expectation that leaders confirm members’ understanding of their job descriptions and reinforce boundaries during regularly scheduled monthly coaching meetings. Selection and Development: I invested at least one-third of my time finding and nurturing talent and expected my fellow-leaders to do the same. Our selection process focused on talent, attitude and fit. After completing departmental interviews, candidates participated in realistic job previews and met with front-line team members to ensure there was clarity with respect to our cultural norms, standards and job expectations. Before extending any hiring offer, I personally interviewed every candidate as a last check to confirm fit that we’d followed all of our hiring best practices. To some, this step might seem excessive, but hiring is the most important decision we make and organizations do well what leaders check. Leader selection is the most consequential aspect of selection and development. Accordingly, it was my highest priority. I am proud of the leadership team we built. Our front-line leaders were passionate about teaching and mentoring, and coached team members for success in their current role with an eye toward preparing them to succeed in their careers. As referenced earlier, one of the most important tools that we relied on to support team members was the monthly development meeting. Leaders invested heavily in preparing for, delivering and documenting these discussions with team members. As a result, all involved shared a common understanding of progress against objectives and next steps to drive individual success and that of the team. Tools to Serve Customers: Research shows that the ability to deliver results to customers is critical to job satisfaction among front line team members. We employed lean and business transformation strategies in our pursuit of continuous improvement of systems and processes to serve external and internal customers. As a result, we deployed a customer-success technology stack that made it easier for team members to better serve more customers. Communication: An entire category of technologies support communication and collaboration in the modern office, and we used most of them. While the technologies were helpful, especially in situations when team members worked remotely or different offices, they do not replace traditional communication tools. We trended key performance metrics on bulletin boards and updated our staff about company developments during regular team and interdepartmental meetings. The informal conversations that happen as team members encounter one another are just as important as the formal ones. “Open-door policies” in and of themselves don’t stimulate the open, honest, transparent and broad communication that most executives agree is essential to productivity and satisfaction. Sysomos offices had open floor plans and an open-door policy, but team members seemed uncomfortable speaking with managers. The responsibility to reach out lies with leaders. When I arrived at an office, I would walk around, smile and greet team members by name and, depending on their schedule, take a few moments to connect. I’m convinced that these small investments in personal communication were important to our subsequent success. Workplace Design: Considerations of workplace design influence satisfaction and productivity. During my tenure at Sysomos, I oversaw the office relocation and expansion projects in Toronto, San Francisco and in the Silicon Valley. Input from our team was integral to our facilities planning process, which balanced factors of accessibility to transportation networks, ergonomic workspace design, lighting, acoustics and meeting space with timing and cost. In Toronto and San Francisco, many of our team members relied on public transportation, walked or rode bicycles to work. Access to major highways and parking were important to our tech teams in the Silicon Valley. Leadership Philosophy: I first learned about the concept of a leadership philosophy as a young Army officer more than 25 years ago. My leadership philosophy is a one-page declaration of my view of the purpose of our team, what teams should expect from me, and my expectations of leaders and team members. Leaders reporting to me developed their own leadership philosophies, which they shared with every team member. By living up to our own words and accepted standards of fairness we earned credibility and trust from the team. Common Courtesy: As George Bernard Shaw wrote in his play Pygmalion, “The great secret … is not having bad manners or good or any particular sort of manners, but having the same manners for all human souls.” Classic books by Dale Carnegie and Gallup offer time-tested advice that every leader should know about the importance of common courtesy and interpersonal skills. These gestures cost nothing but consideration. Leadership is a contact sport. Our leaders were present in the moment and never missed an opportunity to smile, say hello, shake hands and express courtesy, respect and appreciation for team members. We expected team members to do the same. Great Role Models: Strong, positive role models are essential to establishing a healthy leadership environment. I was fortunate to find a great collaborator in our customer-success department head, who appreciated the importance of strong role models. We held ourselves to high standards of conduct and we worked to model our team values. As the business grew and we came under pressure to quickly expand the leadership team, we refused to compromise on quality. Peer leaders played an integral role helping to onboard new team members. By observing and emulating role models, team members learned to act in ways consistent with our values and become successful. Leadership Climate Survey: We set up an anonymous online climate survey and discovered it was an invaluable tool in our quest because it helped leaders and team members reach a common understanding of our engagement levels. We shared the summarized results, participation statistics, comments and responses to every question. Teams composed of front-line staff and leaders built initiatives around the lowest scoring survey questions. In our case, the results spoke for themselves. For 36 months, not a single member of our customer-success team resigned. In fact, we were able to promote about 25% of our staff into other teams where they became top performers. Our customers raved about our customer service to account reps and on net promoter score surveys. Productivity soared as team members found ways to offer better service at lower costs. Just as important were the intangible benefits. The positive energy and enthusiasm that grew within the teams made everyone better. People smiled, said hello on the elevator and as they passed in the hall. They took pride in their work, and you could hear it in their voices when they went the extra mile to help customers. It became competitive to land a role with the client-experience team, which became recognized as the “cool” place to work. The best internal candidates lined up to apply for open positions and some even took pay cuts so they could work in our department. Our best team members referred their friends. As our alumni infiltrated other teams, interdepartmental cooperation improved. Team members liked coming to work and often spent time together outside of work. Casual hallway conversations turned into ad hoc brainstorming sessions to solve problems. With commitment and follow-through, there is nothing to stop any firm from realizing similar results not just with millennial employees but also with everyone else. It was my privilege to play a part in this story. The main credit for the success of our team @Sysomos lies with the superb members and front-line leaders. Very interesting point of view on a topic that has been absorbing an important part of my attention. I appreciate the non-nonsense, hands on approach. I will definitely be putting some of it into practice. Excellent discussion. I would like to add that manager coach-employee relationship could be another solution approach to effectively manage generation Y – Millennials. Based on the literature review on employee coaching relationship, the content presented above matched with the factors on high quality working relationships between manager-coach and employees. This approach of building high quality relationships through coaching is supported with tenets of social interdependence theory, which is the topic of my dissertation.